The Ugandan elections are over, using certain words in text messages meant the messages wouldn't arrive, which I confirmed, but outside observers said the elections were quite free and fair, though locals dispute that, which is something I also heard resonating when asking around. Friday's elections were surprisingly low tech. 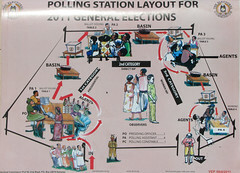 Three elections were held at the same time and the polling stations were no more than marked off open areas where, in stead of a 'police line do not cross', white tape was strung up between a few poles creating a roughly circular area for the polling stations with a series of stations where voters would pass by on their way along the edge of the circle. At the first station, voters' eligibility to vote would be checked, after which they would receive a ballot. Armed with the ballot, at the next station, they would be able to put the ballot inside a small black basin to mark their preference. After this, the ballot was to be folded and put inside a ballot box at the next station. Then, with two more votes to go, this was repeated twice while, following that, at the last station, a fingernail was marked as proof of the voter having done his civic duty. Cycling around town on Friday, when 99% of the shops, cafes and restaurants were closed, I stopped at a polling station close to my hotel at closing time to observe the procedures that followed. Very slowly and very openly, with a several scores of spectators surrounding the polling station, keeping track of the correctness of the procedural steps, the votes were sorted and counted. The whole process was a bit tedious, as it was rather slow, but also surprisingly moving, in a way, seeing the essence of democracy at work right in front of my eyes. 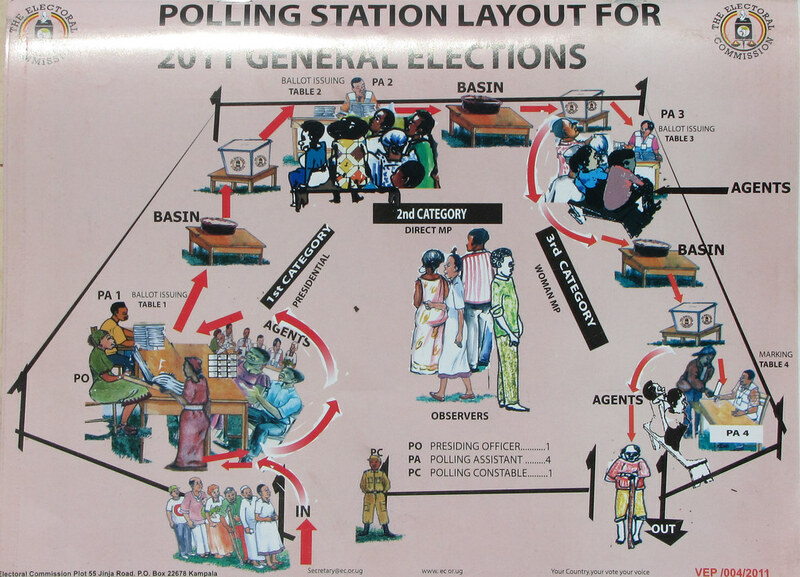 The 2011 Ugandan presidential elections were, at best, a two horse race, with the remaining 6 candidates getting a negligible portion of the votes. Every time one of the non-contenders was awarded a vote, which happened no more than two dozen times out of the few hundred votes which were counted at the polling station I was observing, cheers rose up from the spectators. The incumbent, Museveni, eventually won with about 68% of the votes, which wasn't a surprise at all, as that was close to what the polls predicted. The main challenger, Besigye, collected about 23%, which was a few points higher than was previously expected. Nevertheless, Besigye's supporters are crying foul. To me, it seems that the published outcome of the vote is pretty close to the actual tallies of the votes that were cast. It's no secret that Museveni has been buying votes, changed the electoral make up and plundered the state coffers to get there. And perhaps millions of voters weren't issued with voter cards while plenty names on the registers were shown to be invalid. In other words, it does seem the vote was rigged in Museveni's favor, though the voting itself was rather free and fair. Together with two Dutchies, I was, on Sunday, planning to go to a play at the National Theatre called Crazy storms, aptly "a play on post election violence", but focusing on the Kenyan elections from a few years back. However, we found the theatre very closed, while Museveni's supporters were doing victory laps in town.